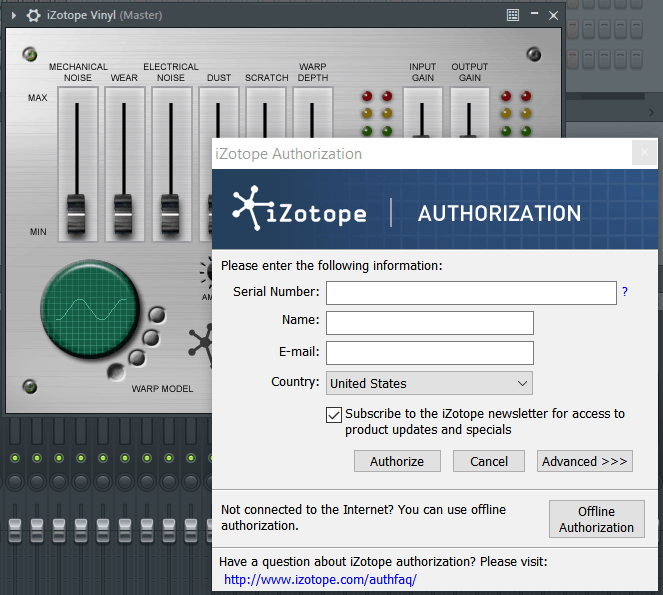 A VST plugin is a piece of 3rd party software that you can add to your DAW. They can be virtual synthesizers, effect modules, spectrum analyzers, and everything in between. We often see the letters “VST” tacked on. VST stands for Virtual Studio Technology, and it’s a plugin interface created by the German company Steinberg (the same company behind Cubase) that allows your plugin software to seamlessly integrate with your DAW. In this tutorial, you’ll learn how to add plugins to FL Studio. Let’s get crackin! There are thousands of plugins out there on the internet. Many of them are free! A quick Google search should do the trick, just make sure they are from a trusted source. You don’t want to make your computer sick or have the police knocking on your door. For this tutorial, I’ll be downloading and installing a free VST plugin called Vinyl by Izotope which I initially found on Splice. Vinyl is great for adding crackling and lo-fi effects to your tracks. At some point, the plugin website will prompt you to download the plugin installer. Make sure you know what folder you’re downloading it to in case you can’t find it. Next, find the downloaded plugin install file and open it. It should open up a plugin setup wizard and guide you through the installation. Make sure you know what folder you’re installing the plugin into, and what architecture your PC is running on (32 bit or 64 bit). Many newer VST plugins will be compatible with both 32 bit and 64 bit, but you want to make sure you’ve downloaded the right one for your computer. Open up FL Studio, navigate to Options, and then click Manage plugins. A new window will open. In the Plugin Manager window, you will see a section called Plugin search paths. These are directories in your computer that FL Studio will search for installed plugins in. You will need to make sure that the existing search paths include the folder you installed (not downloaded) your plugin into in Step 2. If the existing paths don’t cover your install folder, just click the folder icon with a plus, find the folder that contains the installed plugin and add it to the search path list. Once that’s done, click Start scan at the top to let FL Studio scan your computer. Next, find your newly installed plugin in the list and click the check mark next to it on the left side. You can now exit the Plugin manager. This may or may not be required and depends on where you got your plugin from. Other than that, your plugin should be ready for you to use! If you liked this 100% free FL Studio tutorial, let me know what else you’d like me to cover in the comments, on the Synaptic Sound Facebook page, or YouTube channel! Catch ya later!